I LOVE the two-tone cloak color scheme you've used, Santawraith. Reminds me of a Halloween costume I wore as a kid. I'm gonna have to steal the idea... thanks for inspiration! Wow there are some great looking paint jobs on here. Guess I'm gonna have ta get busy on some of my wraiths. Thanks for the inspiration all. Love the look you've achinve on the cloth there @Senzo. It looks just like frost is crawling up on it. The purple looks a bit flat though, could use some lighter highlights on the edges. I like the ethereal-looking robes combined with the witch-like skin, very nice. @Rosebud Yeh good job, they look really simple to paint too! @Hellion Nox , @Farmer7574 thanks! got the recipe from the visions with nagash on cover. I tend to favor mantic's version over the latest GW sculpt. While the scale is a bit small, I think they have a little more character. Damn, they would've fit perfectly in my ME ghost swarm. Cool job there! @Eyeless She looks beautiful in that crimson corset and with long black hair. Great work! This is also in my plog, but decided to throw it here also Nothing special. Anyone tried wraiths made from Empire flaggies? You can find examples on page 1 and 4 in this thread. 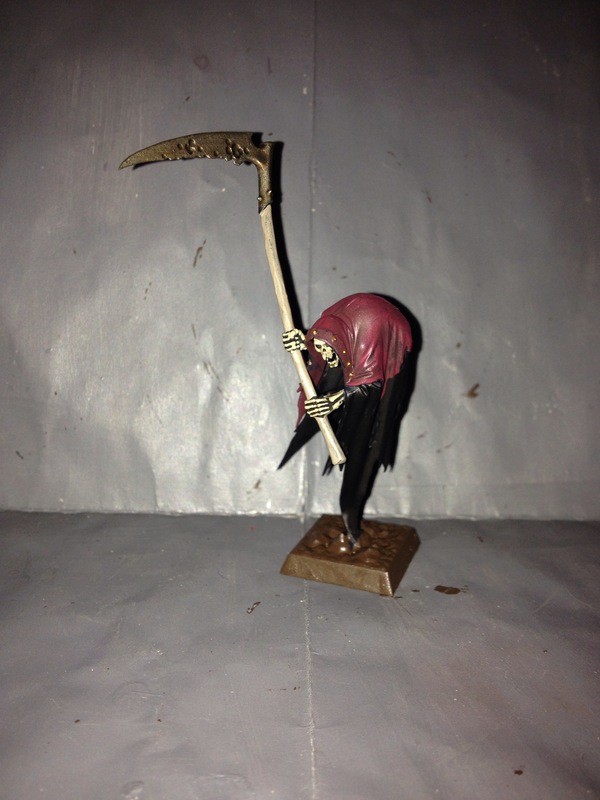 On page 3 there are wraiths made from skelly and flags parts. You can also take a look in spirit hosts section. More stuff in my PLOG. Love it, Farmer! The ghostly scythe and flames are beautiful.